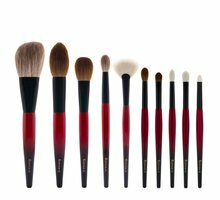 Buff, set, contour, and blend with the Pro Face Set from Sonia G. This collection of Japanese-made face brushes is effortless to use for any skill level and brings out the best in products of any texture or finish. Use the Face Pro to apply powder all over the face, under the eyes to set concealer, or to apply bronzer to cheekbones. 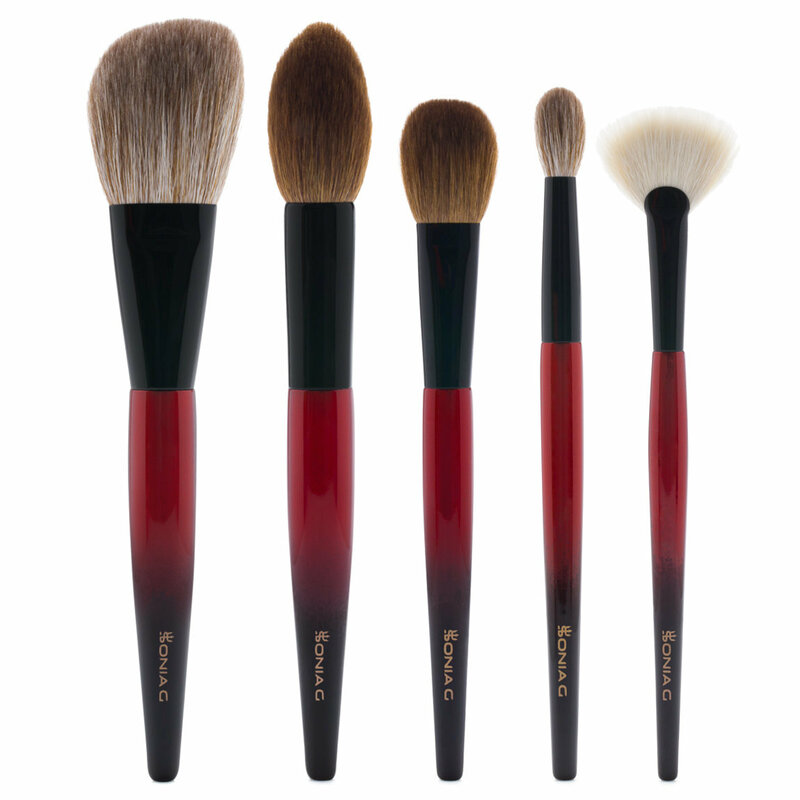 Bronze, highlight, contour, or buff with the Inochige Pro. Flick away fallout, brush highlighter over cheekbones, or blend with the Fan Pro. Use the Detail Pro to set around your nose or eye area, to contour, or to highlight. Apply blush or contour with the Cheek Pro. I am a brush fanatic and own hundreds of handmade brushes from every brand - Koyudo, Chikuhodo, Hakuhodo, Eihodo, Bisyodo, Wayne Goss - and Sonia G’s brushes are by far THE BEST!! They always do exactly what I want them to do and are the prefect density, softness, and bundled to perfection. They also get better the more you use them. I never order brush sets - this is actually my first set ever - but I am so happy I did because there are brushes I wasn’t sure about that ended up being favorites. The large angled face brush is my favorite right now. It applies bronzer like a dream and puts it exactly where I want it and blends with ease. I don’t normally enjoy angled brushes but this one is absolute perfection. The “inochige” is my other favorite brush and it is THE PERFECT blush brush!!!! It places blush on the apples of my cheeks and blends it upwards. It is exactly what I’ve been looking for. This brush feels like squirrel hair but functions like goat hair! I don’t know how Sonia does it - she is literally a magical brush genius. The small blush brush is the perfect “one and done” brush that has short enough hairs to be directional but they splay out enough to blend the product perfectly. The smallest rounded detail brush I will be using for eyeshadow blending or highlighting my eyes. It is a little too directional for face highlighting but perfect for eye work (I have a large eye area). The fan brush is beautiful and firm enough to have great control but soft enough that face highlighting looks natural. This set gives me complete joy and I will cherish these brushes forever. Thank you Sonia!!!! I’m Japanese living in Japan. It’s not easy to find “one” perfect brush even in Japan, especially at this price point. But in this set, you can find 5, not only 1, but 5! I really appreciate Sonia to make me proud of my country. Don’t miss out on these brushes! First of all, I am a huge makeup junkie and love all kinds of makup brushes. 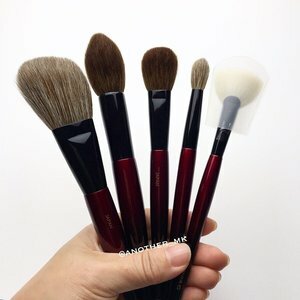 I own Hakuhodo, Chikuhodo, Koyudo, Wayne Goss and many other Japanese artisan brushes, and affordable synthetic brushes from any makeup companies. These Sonia G. Face Pro set makes all of your makup process perfect and seamless. Quality of the brushes are top notch and beautifully made. The price point is just great for the quality. Sonia G. never disappoints me and truly love all of the Face Pro brushes. Highly recommended!! These brushes are EXCEPTIONAL. I would have never thought I would consider buying brushes that are made of dyed hair bristles. (I am very picky about my brushes) BUT The softness of these brushes..... that brown gorgeous color (unique) the variety and the functionality.... these are softer than some of the undyed hair bristles (way softer than Rae morris brushes- btw I don’t like them, cheap goat hair and so overpriced). You can tell the dyeing process is extremely gentle, doesn’t damage the hair, and the hair quality is the best (Saikoho). The handle is just gorgeous. The color, love it, I am addicted now. I have to own every single one of Sonia G brushes;) Perfection. These brushes are really The Best and I own a lot of Japanese brushes but they can't compare to the quality and performance of this whole set. I am so happy with each one and how they perform. You can tell that Sonia G. put a lot of everything into making these brushes her knowledge and years of studying Japanese brushes really comes through in this set. I can't recommend this set enough. I was hesitant to pre-order but, I changed my mind and I'm so glad I did. The softness of these brushes blows me away. They pick up product so well, blend effortlessly without scratching my sensitive acne-prone skin. This set is worth every penny. I'm hesitating about should I keep it after I ordered this set. It's pretty expensive to spend so much money on the brush set to me. I tried this set after I got it, every single brush in this set is so soft, and I use the blush pro on the hourglass blush, it's pick up powder so easily. And the biggest powder brush blends the powder beautifully. This set is worth my investment. Received the set today and fell in love. These are beautifully made, gorgeous to look at yet functional. Magical, perfection, quality beyond your imagination and worth every penny. Bravo Sonia G.
I bought this brush set knowing I do not need another brush set. And honestly, when I first saw this, as beautiful as they were, I didn't think they were necessary. But I really wanted the cheek brush and the detail pro. Knowing how long it would take to make and sell the brushes individually, I decided to take the plunge - you can't have too many powder brushes right? I am so glad I did. The two I wanted are fantastic, the cheek brush picks up pigment in difficult blushes, and the detail pro adds the perfect amount of highlight. But the Inochige is what ends up being the absolute star for me. I use it for powder, blush, highlight, bronze, contour - everything. It had the perfect point and just the right flexibility to be versatile. The powder brush is incredibly soft and is excellent for buffing out an over ambitious bronzer. It's got a great slant to fit into the curves of your face and perfect for setting powder or bronzer. The fan brush is lovely and does a good job, but I don't see myself using it as often, simply because I don't usually use fan brushes. But it does set highlighter down well and gives you a glow from within look. Overall I do love these brushes. Tapered ends feel much more comfortable in my hands. If you do use a fan brush I would recommend you get the entire set. If you, like me, do not, I'd suggest waiting for the individuals and purchase 4 of the 5. If you can wait for it...which I could not. No ragrets! These brushes are beautiful. They are so thought out and perfect to use. I especially Love using them with the hourglass palettes because the pan sizes are smaller, all of these brushes fit perfect in there to pick up the product. One of the stars of the show for me is the fan brush!!! I didnt Expect to love this one so much but I use it with my Natasha Denona Super Glow and it just picks up the product effortlessly. It’s not too flimsy to where it’s hard to pick up product but it’s so soft! My skin has been on the dryer side and these brushes have helped products just glide over my skin not clinging to dry patches. I would say these are well worth the investment you will not be disappointed!